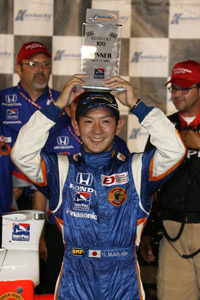 SPARTA, Ky. (August 11, 2007) – Hideki Mutoh led all but one lap of the Kentucky 100 Saturday night en route to victory, but it took a dramatic three-wide pass on the final lap of the race for the Super Aguri Panther Racing driver to collect his first career win on an oval track. It was a battle all night for Mutoh, who spent the majority of the opening laps fighting off a hungry Wade Cunningham, and then endured a long yellow period before the final three-lap shootout. Hideki kept Cunningham and Alex Lloyd behind him on the final restart, but fell behind both drivers in the middle of the back straight on the last lap. “That was oval racing,” he would say later. Mutoh kept his foot in the gas and put No. 55 car on the bottom of the track entering the third turn, and was able to power past both drivers for Panther Racing’s ninth career Indy Pro Series victory. He came ahead of Alex Lloyd to the checkers by 0.1023 of a second. Wade Cunningham, driving the No. 27 AFS Racing car, finished 0.1567 of a second behind. His Indy Pro Series team, joined by many of Panther’s IndyCar Series crewmen, who stayed after their race to watch Hideki, exploded in celebration as they watched him blow past the finish line in first. Hideki highlighted his victory by ripping off some doughnuts for the crowd who all hung around after the Indy-car race to watch Mutoh claim his second career victory. Mutoh made is IndyCar Series debut just a few weeks later at Chicagoland Speedway. "It was a crazy race," said Lloyd, the then points leader. "Early on, the three of us just pulled away. I knew we didn't quite have the car we needed in traffic. I thought we could be good in the lead but in traffic I was struggling to keep close behind. I just stayed patient and few yellows came out. I was concerned that I wasn't going to get the last few laps to make a run for it. We had a great restart and got to second. It was just a great finish and a great race." It has been a trial by fire for Mutoh this season as he perfects his craft on the predominately-oval open-wheel racing scene. The Kentucky event was no easy task, as Cunningham refused to give an inch in an attempt to surpass Mutoh on the track and in the driver’s standings. Hideki was second in the standings at the time, with Cunningham in a close third. But Panther’s young star would come out ahead in the race and in the points chase. His first win of the year came in the first race of the Liberty Challenge at the Indianapolis Motor Speedway, where Mutoh started on pole and led every lap en route to victory.